GATE 2019 Syllabus for Civil Engineering: The aspirants who have successfully applied for the Graduate Aptitude Test in Engineering, now they can download the GATE Civil Syllabus 2019 Pdf. With the help of the GATE Civil Engineering Syllabus, they can get an idea about the topics from which the questions will be asked in the exam. They can also check the GATE Exam Pattern for Civil Engineering which is explained below. The graduate aptitude test in engineering will be conducted in the month of February 2019. The students are advised to Download Gate Syllabus. They have to study according to the syllabus so that they will be able to score a good rank in the exam. The aspirants can download the GATE Syllabus for Civil Engineering pdf by clicking on the links given below. For better preparation of the exam, aspirants will require the GATE Exam Pattern for Civil Engineering. The exam pattern will resolve all the exam related issues. The students can get an idea about the number of questions and their marking scheme with the help of the GATE Exam Pattern for Civil. According to the GATE Exam Pattern, the exam will be of 100 marks. It will be divided into three portions Engineering Mathematics, Civil core Subjects and General aptitude. The 85% weighatge will be covered by the Engineering Math and core subjects. Here we are giving the GATE Syllabus for Civil with marks. The aspirants are advised to study according to the syllabus and exam pattern because they will help them to crack the examination. 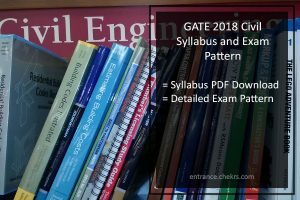 The GATE Syllabus and Exam Pattern for Civil can be downloaded by clicking on the links given below in the table. For more feedback and queries regarding the GATE Civil Syllabus and Exam Pattern 2019, you can contact us by commenting in the comment section given below.